There is something truly homey about food cooked in coconut milk. 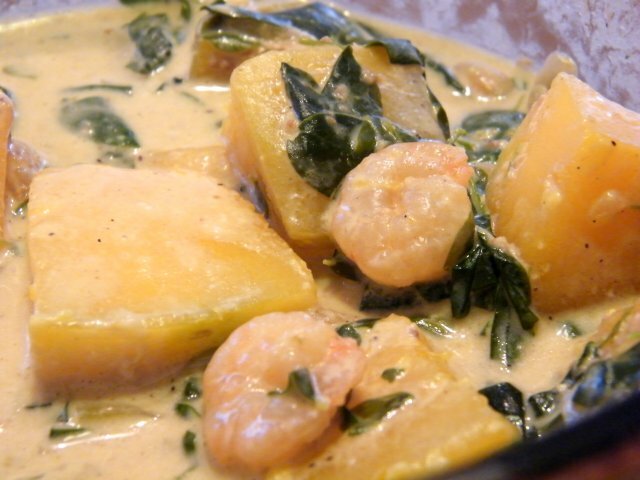 Its creamy sauce is just perfect with rice. Ginataang kalabasa usually comes with shrimp and sitaw (string beans), but the latter is not a common supermarket fare here so my wife cooked this without sitaw. However, we added a note in the procedure below in case you have some. We did have malunggay leaves (Moringa) though and she added that. half of a medium squash, skinned and chopped - good for a family of two adults and a kid! Baby Christine not counted yet. Actually, you can count me as two. Heat up some oil over medium heat. Saute onion and garlic. Add the squash and shrimp paste and give it a quick mix. Spread out the squash on the pan and add enough coconut milk to partially submerge it. Bring heat to medium-low. Cover and simmer for a couple of minutes. Cooking time depends on squash but check after 2 minutes if nearly cooked by piercing a piece with a fork. You need to be able to pierce it with still a bit of resistance. Add the shrimp and malunggay leaves. If you have sitaw, now is the time to add it as well. Cover and simmer for a minute more.